Kathanne Heiny has a voice unlike anyone else. Her writing and characters are smart and fresh--full of precise, hilarious commentary on marriage, parenting, friendship, and dinner parties, etc. When Graham Cavanaugh divorced his first wife it was to marry his girlfriend, Audra, a woman as irrepressible as she is spontaneous and fun. But, Graham learns, life with Audra can also be exhausting, constantly interrupted by chatty phone calls, picky-eater houseguests, and invitations to weddings of people he’s never met. Audra firmly believes that through the sheer force of her personality she can overcome the most socially challenging interactions, shepherding her son through awkward playdates and origami club, and even deciding to establish a friendship with Graham’s first wife, Elspeth. Graham isn't sure he understands why Audra longs to be friends with the woman he divorced. After all, former spouses are hard to categorize—are they enemies, old flames, or just people you know really, really well? And as Graham and Audra share dinners, holidays, and late glasses of wine with his first wife he starts to wonder: How can anyone love two such different women? Did I make the right choice? Is there a right choice? 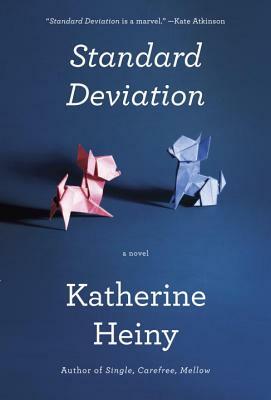 A hilarious and rueful debut novel of love, marriage, infidelity, and origami, Standard Deviation never deviates from the superb.